Every once in a while, a person will come along and beat the odds. They'll combine their natural talent and passion with a lot of hard work and a boatload of perseverance to buck the stereotypes, stump the naysayers, and create something beautiful and new and uniquely theirs. The jazz world lost such a treasure on 20 August when jazz pianist and radio host Marian McPartland died at the age of 95. I'm not a huge jazz fan. I played baritone sax in the school jazz band, but I didn't really "get" jazz. I was much more comfortable playing tenor sax parts in concert band as one of few female sax players. But I've always loved Marian McPartland, who hosted her show "Piano Jazz" on National Public Radio. Since 1978, Marian talked and played with all the jazz greats, instrumentalists and vocalists alike, and musicians from other genres like Willie Nelson and Frank Zappa. Marian took a lot of trouble with everything, especially her show "Piano Jazz." She knew her art and knew the other artists. She was never in competition with them. She wanted to be in conversation with them. Every show went so smoothly, transitioning seamlessly between conversation and music. 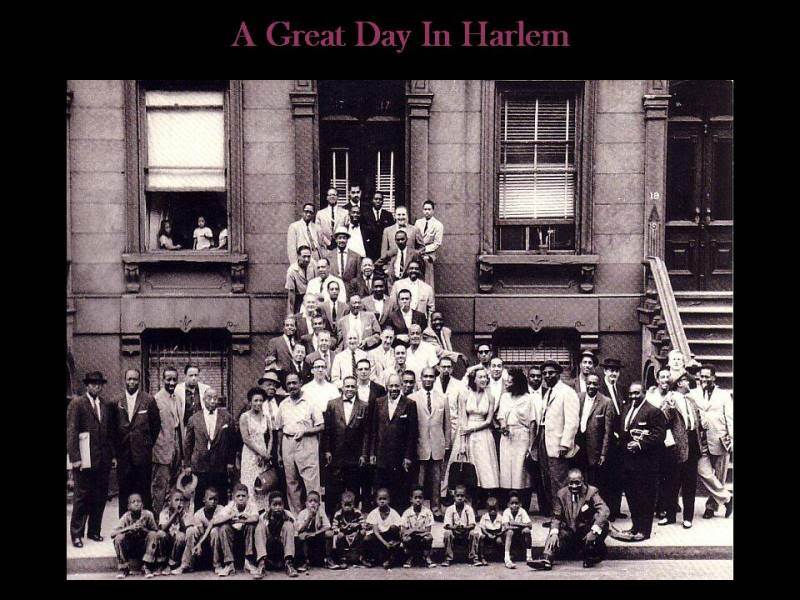 I assumed it was scripted, but it seems every program was as improvisational as jazz itself. I loved to hear her voice, with it's smoky texture and an accent I couldn't quite place. Her show was produced by South Carolina Educational Television for NPR, so I always proudly thought of her as ours. I assumed she was Southern like me. For years I also assumed she was black because she knew so much about jazz and was so highly respected by all the musicians. Imagine my surprise when I found out she was a white New Yorker from England! A white, British woman was definitely an anomaly in the world of jazz, especially in its heyday during the 1940s and 50s. But Marian didn't see that as a reason or excuse to stop doing what she loved. She was a piano prodigy, studying the classics from the age of 3 and learning all genres. But jazz was her love. She met her husband, cornetist Jimmy McPartland, playing the USO tour in Europe during World War II. Jimmy brought Marian back to his hometown of Chicago before they settled in New York. He introduced her around the New York jazz scene, and encouraged her to develop her own style of jazz and eventually her own jazz trio. In New York, she sought out and befriended one of her idols, legendary bebop pianist Mary Lou Williams. According to Marian's biographer, Paul de Barros, "A man might come into New York in 1951 and be kind of gunning for his competition. 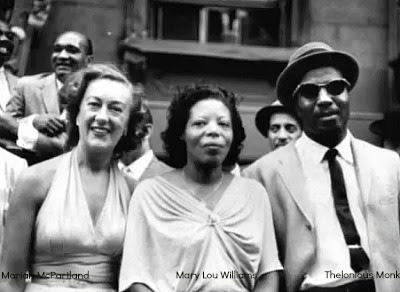 Marian McPartland came to New York City and befriended Mary Lou Williams. She immediately tried to establish a kind of camaraderie with her, a kind of female strategy of 'we're in this together'" That seemed to be Marian's modus operandi at all times, to enter a musical dialogue and challenge with chords and riffs, not with ego. For her, it was all about the harmony. 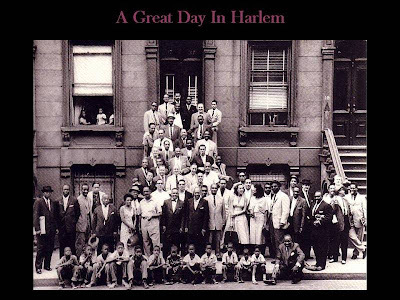 In 1959, rookie photographer Art Kane gathered 57 jazz greats in front of a brownstone in Harlem to create his famous photograph for Esquire magazine, "A Great Day in Harlem." Jimmy McPartland was supposed to be there, but Marian couldn't get him out of bed - most jazz musicians were unaware there was any such thing as 10 o'clock AM - so she came by herself, wearing a white halter dress reminiscent of the one worn by Marilyn Monroe in The Seven Year Itch. Marian was one of three females in the photograph, and the only white woman. Not that she cared. She was with her peers, the people she knew best, the people who shared her same love of jazz. And maybe that's why I liked jazz the Marian-way. It was reminiscent of another time, a more mellow time. She was a pioneer who made blazing trails look good and sound smooth. She never let the fact that she was different get in her way. As a matter of fact, whenever she was told things like "You play good for a girl" or "You sound just like a man", she took it as encouragement. She took great care with her music, but made it seem easy. She never compromised who she was, but brought everything she was to the jazz scene, transformed it, painted it like a multicolor canvas, and then presented it beautifully for the average listener. Even a teenage girl playing a sax in Aiken, SC. Cindi - beautifully written - a testament to a great lady of Jazz and Jazz itself!